Sleek, breathable, and perfect for a variety of working environments, the Raynor Eurotech iOO Chair with Headrest is ready to bring your office a step closer to ideal ergonomics with one seat. Adjustable headrest, tilt lock, and adaptable arms make this seat a configurable chair of the ages. 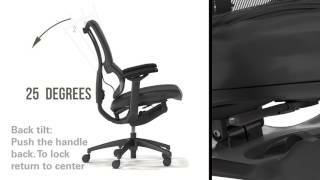 Available with a ventilating mesh back and your choice of white or black frame for even more style for your office, you'll appreciate the Raynor Eurotech iOO Chair's ergonomic features found in one uniquely-supportive seating solution. The Raynor Eurotech iOO Chair with Headrest can be ordered in either a black or white frame; both configurations come in black mesh. Over time my leather chair from Office Depot started to shed its look and comfortableness. The leather had been coming off from it and the seat had been flattened to the point where I was able to feel the bolts underneath. I invested in getting a mesh chair after reading so many pros about them. I came across this one, purchased it, and do not regret it at all. Has pretty much everything my old leather chair didn't.. lower back support, a headrest, adjustable arms, you name it. Super comfortable and easy to reach controls! It took me a long time to find a chair that was going to look good in my new home office I built(photo). I looked at the Ergohuman Elite chair, I liked it but didn't love it., I wanted a modern look (white) and also very comfortable and adjustable. The quality of the chair is excellent, very well built and man its solid & heavy. There was no local store had this to view in person and also not much reviews on the internet. I took a chance and bought it online from the human solution. When it arrived and put it in my new office it looked amazing. I have had so many people say wow that's a chair. Everything about the chair is better than I expected, I will list the honest pros and cons bellow. Pros: Looks amazing, great built, very comfortable and adjustable. Easy to assemble and adjust on the fly. Excellent lumbar support, head rest flexible and comfortable. Love the arm adjustments on the chair. Cons: I really like the mesh chair, but my first choice would always be leather. I wish they had that option for the IOO , it would look amazing white and black leather and the seat cushion under leather gel pad. The arm adjustable are great, only wish it had more resistance to adjust, sometimes I find the arms adjust easily with little pressure on it. I had/have a tear in my iliolumbar ligament that the medical profession tries to pass off as a syndrome. Start with dry needling then move to prolotherapy. This wore out the joint between my SI and the Lumbar on top of it with disc degeneration. I'm able to sit comfortably for long periods of time now when I use reminder software to give me periodic standing break times. Pros: Many, comes with everything except foreword seat tilt which isn't that great anyway. One easy to reach lever controls everything. This product comes standard with a limited lifetime warranty on seating components, and a 5-year warranty on the upholstery and foam (excluding armpads). $710.00 List Price: $1,252.00* The list price is the same as the MSRP (Manufacturer's Suggested Retail Price). It may not necessarily be the price at which the product is sold.